Over the past year analysts at Birinyi Associates have developed a proprietary new trading program used to identify stocks as they gain negative momentum. 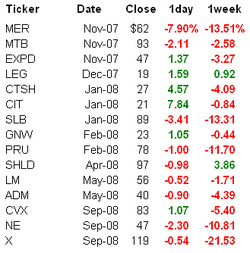 This program has identified a select few stocks, only 15 out of the S&P 500 names in the last year, 13 out of the 15 have been down over the following week for an average decline of -5.9% over the week. Some of the previous stocks are highlighted below, subscribers of Birinyi's Mini-Institutional service received the three new stocks via email already this morning. Click here for more information about the Mini-Institutional service by Birinyi Associates, or call us at 800-357-4468 for details.